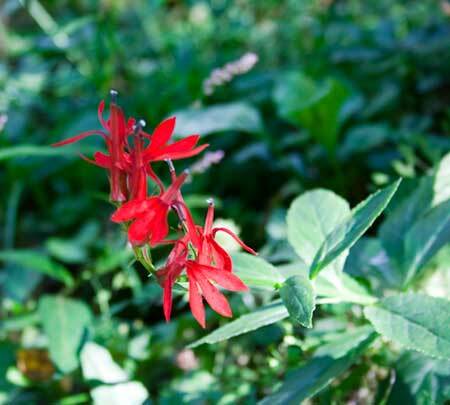 The Roaring Fork Motor Nature Trail is a 8 mile one-way loop road. The loop is loop is reached off of Cherokee Orchard Road in Gatlinburg, Tennessee. The Roaring Fork loop is not suitable for bicycles, RVs, trailers, or busses. The Roaring Fork loop is 8 miles. 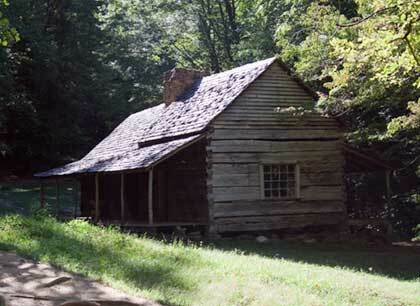 This is one of our favorite drives in when we visit Smoky Mountain National Park. The drive wonders through a pretty second growth forest. It follows Roaring Fork Creek for much of the way. There are plenty of things to stop and see. Old cabins, rock walls, and the creek. It's always good to park the car and walk down to Roaring Fork Creek. 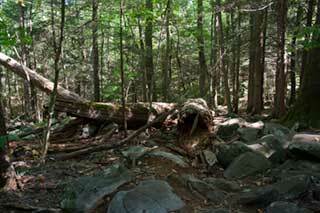 Plus there are a few short hikes. So if you take your time, and stop and see all the sights, you can pretty much spend most of a day here. An old grist mill is one of the interesting sights along the loop. The park service is doing a good job of keeping the mill up. It is in about the same shape it was when we first visited in 1972. 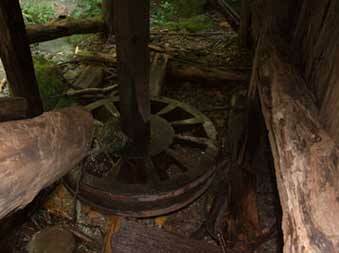 One of the things that makes this mill interesting is that is uses a turbine instead of the more usual water wheel. The turbine here is made of wood. 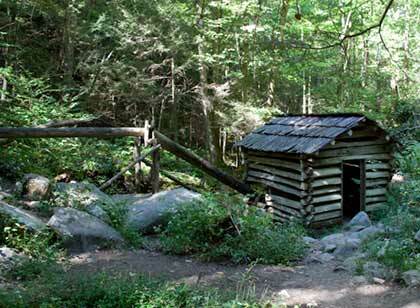 Mingus Mill in the Oconaluftee area of the park also uses a turbine. 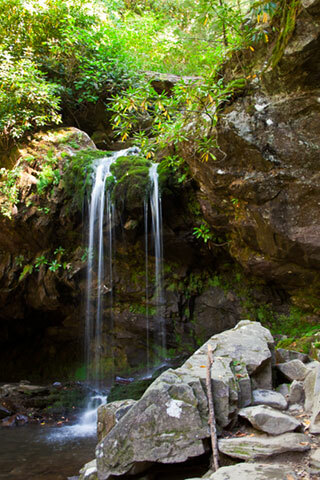 A must do hike is the hike to Grotto Falls. This is a 1.2 mile one way (2.4 round trip the park guide says 3 miles round trip) hike to a small waterfall. The falls is about 25 feet high. The trail runs behind the falls. On a hot day, the cool mist from the falls a great way to cool off. In the spring and after a good rain, the falls has a fair amount of water flowing over it. When we were there in September 2007, things were pretty dry and the falls were just a thread of water. 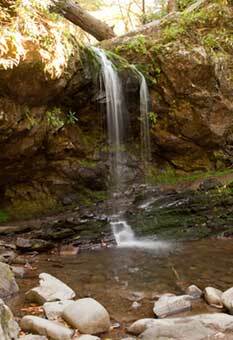 Although the waterfall is small, it is pretty and the hike is a nice way to stretch your legs after riding in the car. 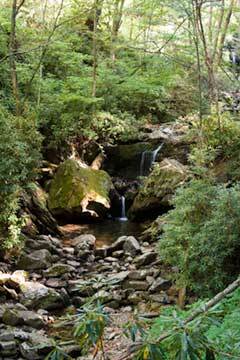 Spring or early summer, would be a really great time to visit here--especially if the Rhododendron were in bloom. We'll have to check the flower schedule and catch the Rhododendron one of these days. 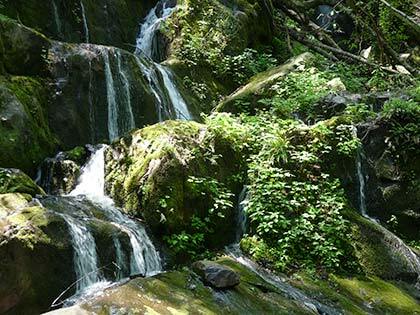 The place of 1,000 drips is a wonderful water fall in the spring or after a good rain. In the fall when water flows are low, ther is often not much to see. But when we were there in May 2012 it was a very beautiful place. This is stop #15 on the Motor Nature Trail, Parking is on the right just past the falls. It is limited to a few cars, so you might have to find a spot and hike back. Travels with Nessie Home :: Site Map:: Contact webmaster@ncsparks.com-email us:: Copyright Leslie Sparks 2006, 2007, 2008, 2009, 2010, 2011, 2012,2013,2019:: Last modified: March 01 2015.